After living in Edmonton for just 11 months, I realized how much the ocean meant to me. However, you sometimes do not realize the things that matter most until they are gone. The Northern Peninsula in Newfoundland has many hidden gems and most of its residents, including myself have never taken the time to experience what there is to offer. This summer, I took a “stay-cation”, meaning I vacationed at home. But not in the typical sense that I just watched re-runs of All in the Family or the Golden Girls, I got out there and did things and spent money helping local businesses and trust me I was not disappointed. Friday, June 25, 2010…it was still raining in the AM. However, being a smart camper I had my car packed the night before. I left before lunch and my first stop was the Anchor Cafe, Port au Choix. The food at this restaurant is soooo good that I drove off route about 30 kms just for lunch. I had a bowl of their delicious fish chowder and Mussels a la Byron. The mussels were to die for!!! Earlier in the week, I tried blueberry pie at two other locations, so I couldn’t resist theirs with a scoup of vanilla ice-cream. A real contender with grandma’s! If you want a great meal while sitting on board a well-theme restaurant this one is it for you! My resting place for the night was Kampgrounds of America, Rocky Harbour, known locally as “Spirity Pond Park”. To start, they have the cleanest restrooms and showers that I have seen at any campground that I have stayed. I pitched the tent and headed down to the office to rent a canoe, as it is Gros Morne National Park and the sun was beaming! 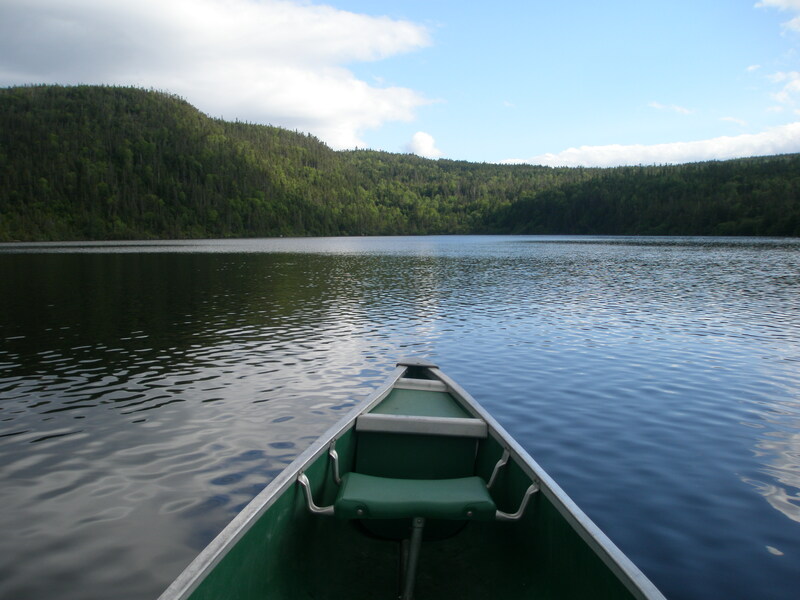 It felt good to be alone and in charge as I paddled my canoe on a serene pond. It gave me a chance to relieve the stresses work may bring and gain a sense of freedom and power with every paddle I did take. (Thank you again Sandi Boucher – I will paddle my canoe with great confidence in whatever waters life so chooses to take me). Later in the evening I drove to airport to pick up a friend, who I met while studying abroad in the Czech Republic almost three years ago. This person has worldly experience, lived in many parts of Canada but yet to experience the Rock! Needless to say it was great to see him again and telling him its the rural life. He believed me, when his FIDO cell did not have coverage (note to those needing cell coverage; Bell or Telus only). After cooking up a scoff on the imitation Coleman stove, eggs, bacon, ham, toast and hot chocolate we ventured off to get an interpretative tour of the Tablelands, which are designated a World UNESCO Heritage Site. I had no idea that the formations were due to the tectonic plates, faults and the inner layer of the earths crust ending on top of the surface. As well, that later in the week I would be going to Africa (the Avalon Peninsula). A visit to the Discovery Centre proved to be more than informative. As well Trout River was quite scenic and the restaurant well it had a nice view of the ocean and was mentioned in Frommer’s for all you travellers out there. The mussels and chowder were very good (no blueberry pie though for me this time) :). The evening was spent at Gros Morne Theatre Festival with a cast from Theatre Newfoundland. The first viewing was the Ethie, regarding a ship wreck that happened near the coast of Sally’s Cove. The cast remarkable, allowing for humor and great interaction as the meal of pan fried cod, whipped potatoes, vegetables, fresh rolls, tea and patridgeberry cheesecake were served in the galley by cast members. Despite the storm, no one got sea sick and all 92 of us survived! The show was so good that we decided to take in an encore presentation – Double Axe Murder. I can’t wait to see the other shows this summer! If you hadn’t heard, Tempting Providence, which is one of Gros Morne Theatre Festival’s shows has gone on tour in California. It depicts the life of Nurse Myra Bennett, who was a missionary for the people of Daniel’s Harbour and surrounding areas. I stopped in to visit her home, which is now a historic site and got a remarkable interpretation from two lovely nursing students. A great $5.00 investment to learn a lot local legends and about the way of life in the area in the 19th and 20th centuries. Well worth not by-passing the community to all you readers out there! I was only two days in my vacation when I began to realize I would not be able to fit all I wanted to do….which made me quite satisfied because I live here and can see what the Great Northern Peninsula is all about and will choose to experience all the wonders we have at home! Tomorrow, I will write about Lambi, Vikings, Fine Dining, Dr. Wildfred Grenfell, Spanish artists, icebergs, polar bears and more…. 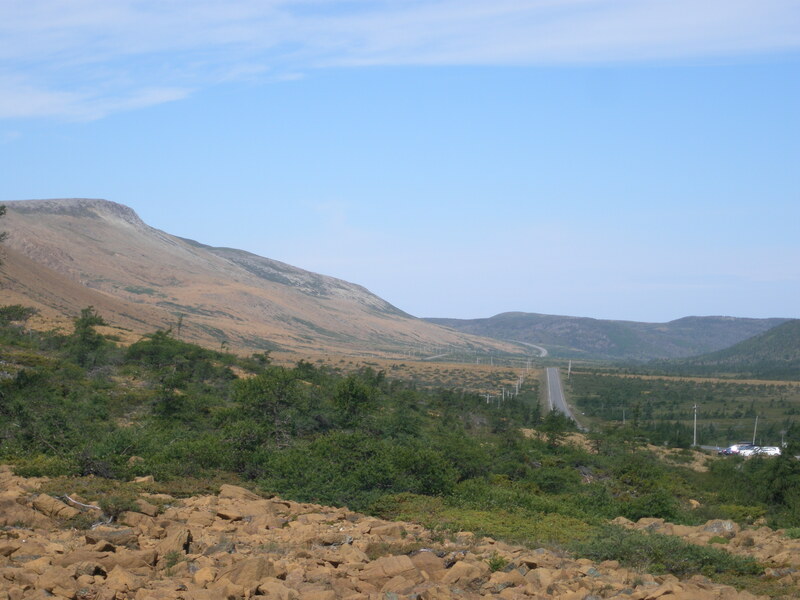 Posted on July 6, 2010, in Categories, Cuisine, Heritage, History, Landscapes/Geography and tagged Camping, Chowder, Fjords, Gros Morne, Mussels, Nurse Myra Bennett, Shipwreck, SS Ethie, Tableland, Tempting Providence, Theatre, UNESCO. Bookmark the permalink. 1 Comment.